This hole is a long par 5 that doglegs left just beyond the reach of the average hitter's tee shot. The right side of the fairway funnels into a large pond on the right side of the fairway that's not visible from tee. The tall trees on the left can keep you from cutting the corner if you get to close to them. The best tee shot starts straight down the fairway with a slight fade. This will put you far enough away from the tall trees to enable you to cut the corner with a short iron. The green slopes from front to back. A big drop-off behind the green will severely penalize you if you miss the green long. 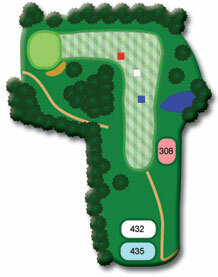 Missing the green right will leave your ball nested in a small clump of trees. . The green slopes from back to front and from right to left. Be sure to ring the bell once you've cleared the second hill.